We don’t only learn when we sit in a class; we actually learn a great deal during social and other activities we are involved in daily, or when volunteering to do work for free. A team leader in a church youth group learns leadership skills, a volunteer at the local HIV/AIDS clinic acquires nursing skills, and you learn a lot about business from doing odd jobs in your friend’s construction business. This section describes the skills that you can acquire through work experience, programmes offered at Community Education and Training Colleges, informal short courses and free courses offered on the internet. Improving your self-esteem and the confidence that is gained from having acquired skills that can be used to benefit yourself, your family and your community. People who need to develop skills in a specific area to meet requirements for employment or entering a formal programme, e.g. by serving on the finance committee of the local church to develop financial skills. Which informal learning opportunities are described in this section, how much do they cost, and how are they funded? This table indicates the types of informal learning described in this section of the website, with the cost and funding source, where relevant. 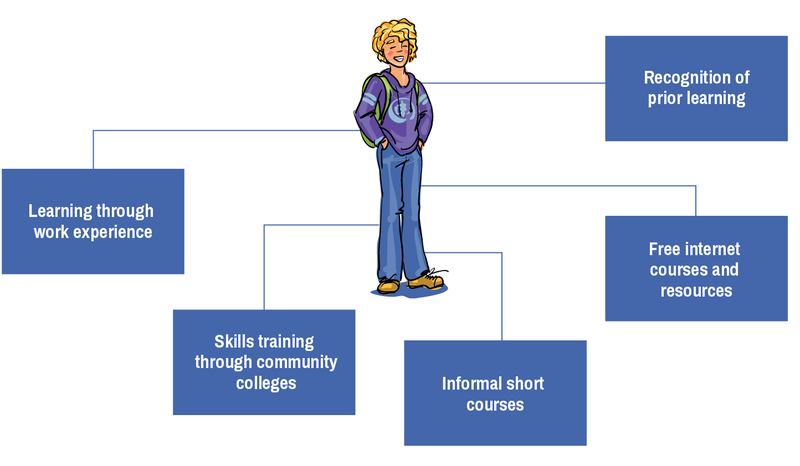 How are programmes for informal skills acquisition funded? Most of the programmes and learning opportunities described in this section are free as they are funded by the Government, the Sector Education and Training Authorities (SETAs), the National Skills Fund (NSF) or through dedicated funding. In some cases beneficiaries have to pay small amounts for participating in opportunities for informal skills acquisition, as indicated in the table above. The Government introduced a Youth Subsidy in January 2014 as a tax incentive to encourage employers to employ young people (between 18 and 29 years) for on-the-job training and the development of skills through work experience. The Youth Subsidy motivates employers to take young people into their businesses for a maximum of two years under certain conditions. This training and work experience will improve the chances of these young people finding employment or succeeding in their own small businesses.